For best results it is recommended to have a mentor guide you through the entire 12 lessons of the program, however we understand that some people prefer to learn at their own pace with a small amount of support. We also understand that some people have limited financial resources to invest in a coach to take them through the entire program. With this in mind as of 22nd December 2017, Blue Chip Minds is offering you the opportunity to participate in this powerful program at your own pace and at price tailored to suit your budget. 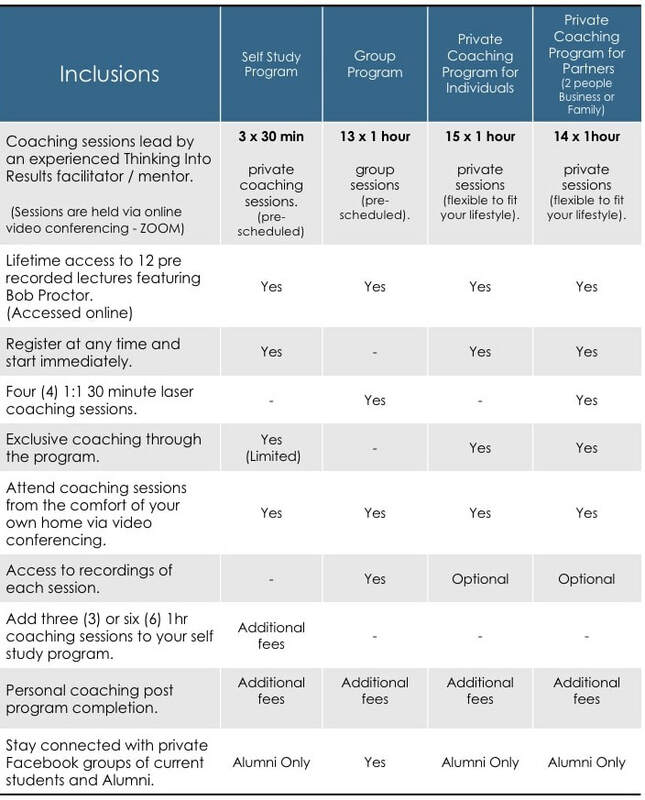 We also know the power of being held accountable by a coach and having a mentor to guide you through this life changing content therefore, every Blue Chip Minds Self Study program comes with 3 x thirty minute private coaching sessions, with the option to add additional coaching to suit your needs either at the time of registration or as you are progressing through the program. You will also have access to other Self Study Students via a private Facebook page to allow you to share the journey and ask questions of your coach outside of the formal sessions.